I come, my sweet, to sing to you. that there were flowers also in hell. while our eyes fill with tears. colors it to make it wholly credible. Listen while I talk on against time. It will not be for long. something central to the sky which ranges round it. An odor springs from it! Honeysuckle! And now there comes the buzzing of a bee! and a whole flood of sister memories! time to recall them before I shall speak out. The asphodel, forebodingly, among them. I bring you, reawakened, a memory of those flowers. that brings me near to you. The color was the first to go. the lily’s throat to the hummingbird! Endless wealth, I thought, held out its arms to me. A thousand tropics in an apple blossom. The generous earth itself gave us lief. The whole world became my garden! and the waves are wakened. when it puts all flowers to shame. and other sea wrack and weeds. knew its rose hedges to the very water’s brink. and there, later, we went to gather the wild plum. but often found myself there in your pursuit. I do not like it and wanted to be in heaven. Hear me out. Do not turn away. and out of them about love. Death is not the end of it. which can be attained, I think, in its service. Its guerdon is a fairy flower; a cat of twenty lives. If no one came to try it the world would be the loser. as one who watches a storm come in over the water. before the spectacle of our lives with joined hands. Lightning plays about the edges of the clouds. that will soon reach the apex of its bloom. We danced, in our minds, and read a book together. You remember? It was a serious book. And so books entered our lives. and Helen’s public fault that bred it. would have called it simply murder. The sea alone with its multiplicity holds any hope. and the will becomes again a garden. and the place made in our lives for the poem. but you do not get far with silence. we could not meet otherwise. that at one time we were young. Imagine you saw a field made up of women all silver-white. What should you do but love them? The storm bursts or fades! though I knew you as a woman and never thought otherwise, until the whole sea has been taken up and all its gardens. that moved me and that I saw in you. is a flower makes many ill who whiff it. We had our children, rivals in the general onslaught. I put them aside though I cared for them. that I could not cry to you in the act. I come, my sweet, to sing to you! of something that concerns you and concerns many men. Look at what passes for the new. You will not find it there but in despised poems. If you haven’t seen Bob Simon’s recent 60 Minutes report on Israeli settlements in the occupied Palestinian West Bank and the ways in which settlers intend to prevent a peaceful resolution of the Israeli-Palestinian conflict, it’s time to do so. Then scoot over to JStreet and join other rational progressive Jews in sending a message of support to Bob Simon for his accurate, thorough, thoughtful and fair coverage of this critical issue. Now. And point others to the report. It’s about time we advocate the un-settling truth of the West Bank settlements and the dangers they pose to a just and sustainable peace. Israel’s use of white phosphorus on Gazan civilians is thoroughly documented. It is beyond question. It is nauseating. So now it’s time to process the facts. It’s time for unequivocal and undiluted public criticism. If a just and lasting peace in Israel-Palestine is to be achieved, it can only follow from universal acknowledgment of the truth of the awful tragedy of Gaza and the realities of official Israeli policies regarding Palestinian autonomy. The last time I checked, American Jews were still part of the universe. We simply cannot publicly claim to want peace but support Israel’s avoidance of it. It’s time to put up or shut up. Until then, how dare we sing “Lo yissa goy” in a place of worship, or anywhere else for that matter. If you aren’t sickened by the evidence, you should be. If you aren’t ashamed, you should be. If you haven’t spoken out, then speak out! The shelling has stopped. There’s ceasefire, or ceasefires. After the nauseating devastation of the past few weeks, I want to do something in response to ceasefire. To preserve seven fragile days’ quiet. There’s so little to contribute from one pair of hands, one computer, one home, on this side of the world. Except more art. And another vigil. 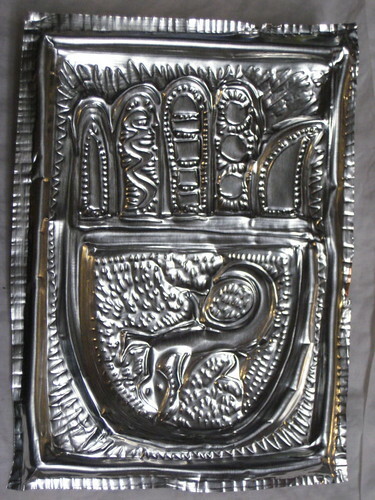 I return to the hand. My hands. 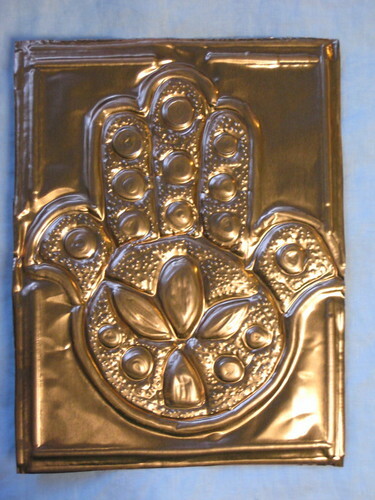 The Chamsa / Hamsa / Khamsa hand, hand of Miriam, Marjam or Fatima, shared icon of fortune. 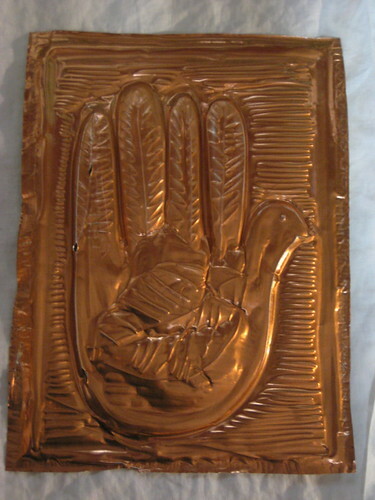 For me, the hand is a symbol of peace and friendship. 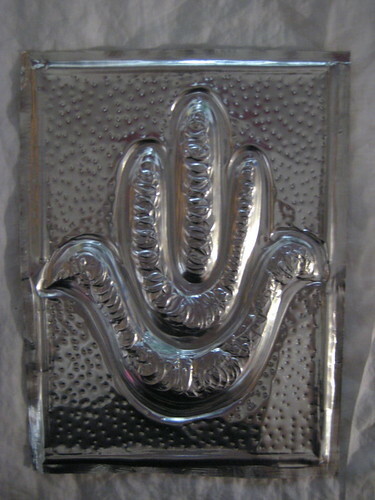 One hand outstretched each day, ready for relationship. Eight days a week, this week, for peace. 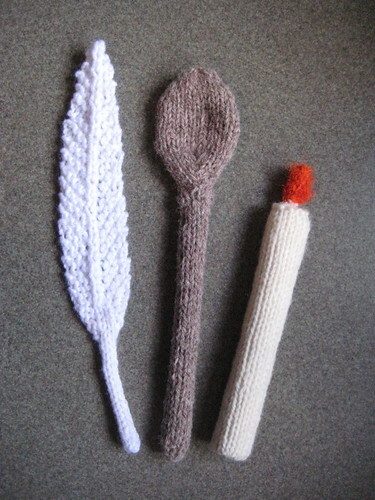 (left to right): 1. 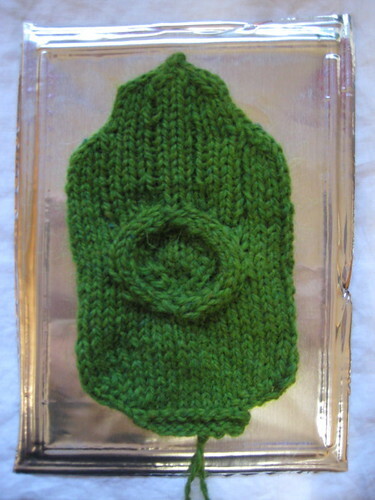 Susan Hajjar’s crochet Chamsa pattern; 2. my own double-knitted Hamsa leaf pattern (both on their way to the TikkunTree); 3. transparent (glue) Hamsa; 4-8. copper and alloy foil Hamsas. 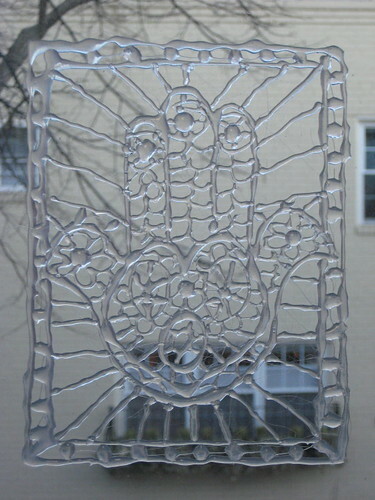 (additional images of the Hamsa Vigil here). A meditation on the seven days’ ceasefire. Yesterday morning, after weeks of violence in Gaza, I attended a Torah study session that included (finally!) discussion about Israel’s war in Gaza. 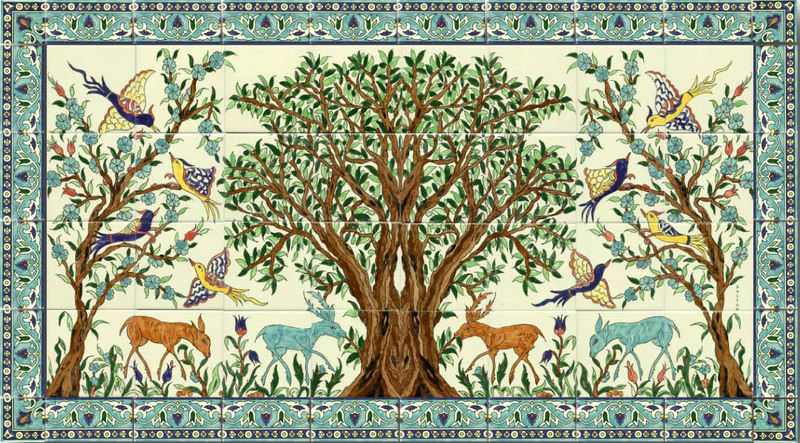 The biblical narrative was Parshah Shemot (Exodus 1:1-6:1), the origin of communal displacement and subjugation of a tribe, since the memory of the leader Joseph – so cherished by Israelites and Egyptians alike – has faded beyond all recall in Egypt. The business of memory and tribalism set me thinking. 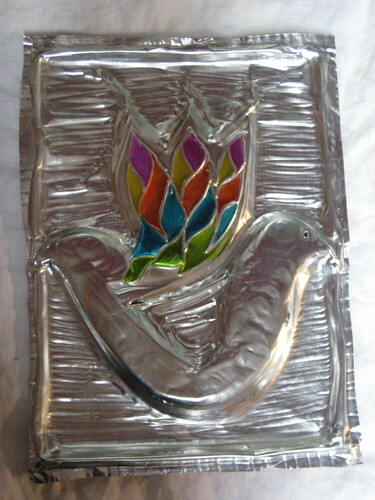 The rabbi offered a two-pronged approach … first, a set of readings addressing “How Palestinians and Jews see each other”: excerpts from the Hamas Charter (calling for perpetual Jihad against Israel and the Islamification of Palestine) and from the Greater Israel Movement‘s expansionist doctrine, the autobiography of Abba Eban (remarking that Jews in Israel cannot be accepted by Arabs without a transformation of Arab conceptions of mid-east reality), as well as recent reports from Egyptian officials of internal disagreement within the ranks of Hamas, and that the Syria-based leadership has taken a harder line on ceasefire than the Gazan-based leaders (International Herald Tribune, 1.16.09). And so we were led through a discussion of the challenge of extremism on both sides, the challenge of overcoming Arab world-views, and the challenge of diaspora – of judging the situation from outside it (whether the distant vantagepoint be occupied by Hamas leaders in Syria, or a small bunch of Jews in Philadelphia). Then, a set of readings on the ethics of war; and discussion … on the ways in which Torah and Talmud address the use of violence: That Judaism authorizes killing in self-defense (“If he comes to kill you, arise and kill him,” Sanhedrin 72a); that war may thus be waged so long as one offers peace before attack (“When approaching a town to attack it, first offer them peace,” Deuteronomy 20:10), and even so, all violence undertaken will have to be accounted for to God (“Whoever sheds the blood of a human being by a human being shall his blood be shed, for in the divine image did God make humanity,” Genesis 9:6). And the “discussion”? Little more than excuses for Israel’s decision to initiate war in Gaza …. rockets fired on Israeli civilians nearby, Israel’s efforts to warn Gazan civilians to leave areas under attack (I’m still dumbfounded that this was uttered in my presence), and lame confirmation that just war is tallied fairly. A safe, generalized, benign apologetics for war – rather than confronting the realities of the particular warfare Israel has been waging or an exploration of strategies for achieving peace. No one was able to explain how Israel’s phosphorus shelling of congested urban areas is remotely “justified” under the texts in hand. No one replied to my local analogy – the destruction of an entire city block following the firebombing of a single nuisance home – MOVE house in West Philadelphia. No one could explain how Israel’s use of white phosphorus – whether as smokescreens or illumination for targeted assaults (as claimed) can – in light of the anticipated injuries to all civilians in the vicinity – be compared to anything other than Napalm strafing in Vietnam, and any other chemical warfare abhorrent to civilized men and women. Chemiluminescence (sometimes “chemoluminescence”) is the emission of light with limited emission of heat (luminescence), as the result of a chemical reaction (source). So I want to know more about white phosphorus. How is it that even my unschooled imagination is alarmed by even the vaguest descriptions of the stuff, yet most of my fellow congregregants – and the rabbi – remained sanguine. I’ve googled, read news accounts and UN reports. What do I know? Well, it looks harmless enough – like a piece of white fudge, or a bar of oatmeal soap (source; and information about white phosphorus as weapon). Glows in the dark … (like Moses’ face after receiving The Law?) . Anyone can read about it’s general chemical properties, but seeing the stuff subjected to simple experiment is a much more effective way to understand UN criticism of Israel’s use of white phosphorus in Gaza. 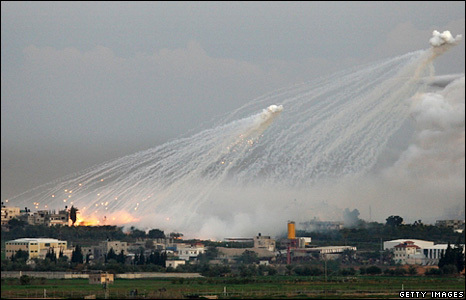 And when white phosphorus takes to the airspace over Gaza’s congested cities … what does that look like? Like this – captured in still images, or in motion. So what about those readings the rabbi provided to us for study? Unfortunately, the issue is not whether Israel is justified in defending itself, but whether the particular means it uses are legitimate. How it defends itself is the question. The International Committee of the Red Cross urged Israel to exercise “extreme caution” in using “incendiary agents”) to illuminate targets at night or create a smoke screen for day attacks. According to the Red Cross, phosphorus devices should be treated as chemical weapons because they cause severe chemical burns. 111 nations, including most NATO allies, have signed a treaty banning the stockpiling and use of white phosphorus devices; neither the US nor Israel agreed to sign the document. Although cluster bombs and similar devices (like white phosporus munitions) are not explicitly forbidden by the Geneva Law, the rules of war prohibit the use of inherently indiscriminate weapons or weapons that are incapable of being used in a manner that complies with the obligation to distinguish between civilians and combatants. Those who use them in civilian areas (including Israeli Jews) therefore open themselves to charges of war crimes. 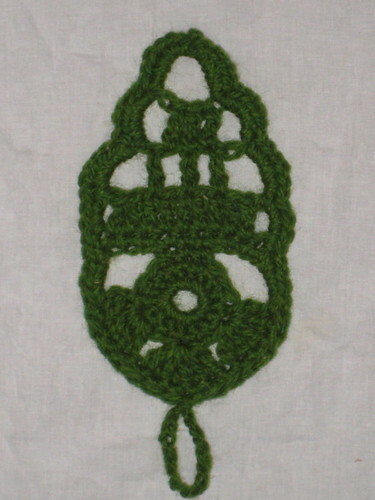 Well, I’ve devised another kippah for The Minyan, to be used as a thinking cap during reflection. 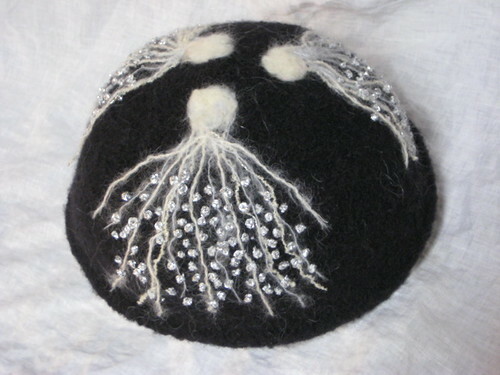 A beautiful kippah, covered with billowing white and silver bursts of white phosphorus. Try it on and see how it feels. It won’t hurt; it’s not Hercules’ cloak. It’s luminous. Would that it illuminated the difference between right and wrong. Without contrived apologetics for Israel’s outrageous abuse of its right of self-defense, and without contrived excuses for our inexcusable denial of the humanity of those Gazans, who – scorched beyond recognition by munitions launched by Israeli Jews – also reflect my idea of the image of the divine. It’s always a challenge to know where to find reliable information, in order to judge the conflicting claims (Israel denies using white phosphorus innappropriately in Gaza) and reports. Additional information about evidence of Israel’s use of white phosphorus in Gaza can be found at Res ipsa loquitur (”The thing itself speaks”) legal blog, here, here and here.